Stick these stocks in your portfolio and check back in a couple of decades. No one knows what the world will look like 20 years from now. But you can be reasonably sure that people will still need their garbage collected, that big organizations will still need IT, and that consumers will still be willing to pay for high-quality entertainment. That's why three of our Motley Fool contributors think Waste Management (NYSE:WM), International Business Machines (NYSE:IBM), and Sirius XM Holdings (NASDAQ:SIRI) are great long-term bets. Tyler Crowe (Waste Management): There's a reason Waste Management is a significant position in my individual retirement account, even though I'm several decades away from retiring. It's a business in an incredibly resilient industry, and also happens to have a management team who have proved to be good stewards of shareholder capital. When making an investment over such a long-term time horizon, those are two qualities I value more than any others. No matter where we are in an economic cycle, there will always be trash to be properly disposed of. What's more, handling and disposing of trash is a highly regulated, capital-intense business that keeps new entrants out and gives Waste Management and its larger peers incredible economies of scale over smaller players. Waste Management may not have a legal monopoly in the regions it serves, but in many cases, it's as close to a monopoly as you can get. WM Average Diluted Shares Outstanding (Quarterly) data by YCharts. A lot has changed over the past couple of decades, but one thing that hasn't changed much in that time is the trash-handling business; chances are that it won't change much over the next couple of decades, either. So if there's a stock worth hanging onto over a multidecade timeline, Waste Management should be near the top of the list. Tim Green (International Business Machines): Given the terrible performance of its stock in recent years, it can be tough to be optimistic about IBM. The company returned to revenue growth in the fourth quarter of 2017, but its streak ended in the third quarter of this year. IBM's growth businesses, like cloud computing and analytics, couldn't overcome currency fluctuations and weak sales in certain legacy businesses. With shares of IBM down about 26% this year, the stock is outrageously cheap. IBM trades for just 8.2 times its full-year adjusted earnings guidance and less than 9 times its full-year free cash flow guidance. 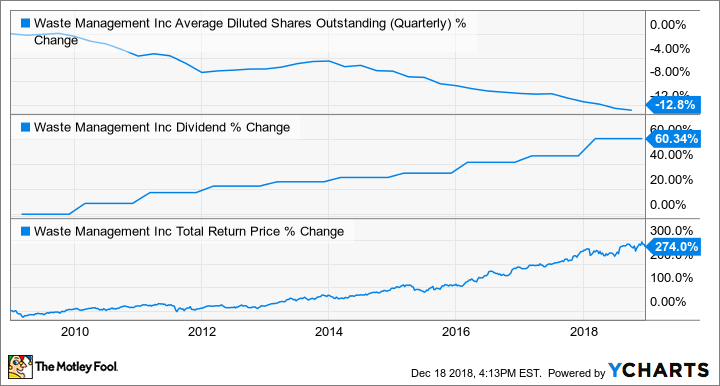 The stock now sports a dividend yield of 5.5%, and IBM has been growing that dividend annually for the past two decades. The company is betting that the future of cloud computing is hybrid and multicloud, and to that end it recently agreed to pay $34 billion for Red Hat. It's a massive deal that involves a lot of additional debt, but it could pay off if the company is right about where the cloud computing market is heading. IBM's big competitive advantages are its entrenched status in a variety of industries, its decades-long relationships with many of its customers, and its ability to provide full-scale, integrated solutions involving a wide range of technologies. IBM is still around today because of these advantages, and while they don't guarantee the company will succeed in the future, they do make IBM stock a lot less risky than it appears. Sean Williams (Sirius XM Holdings): Two decades is quite a bit of time to hold a stock, but I can think of few better choices than a legalized monopoly in the satellite radio space: Sirius XM. Could Sirius XM face challenges over the next 20 years, despite being the only operator of satellite radio? Well, absolutely. It has to worry about deep-pocketed players like Apple that aim to lure away consumers with music and streaming services. There's also Sirius XM's nearly $6.6 billion in debt, which actually pushes the company into a negative book value. But the positives that Sirius XM brings to the table far outweigh the negatives. For starters, investors need to understand that there's a big difference in the way Sirius XM generates revenue and how its competitors do. Most terrestrial and online radio services generate most of their revenue from ads. This works just fine when the economy is expanding, but it can put the entire business model in jeopardy when recessions inevitably strike and advertisers pare back their spending. By comparison, Sirius XM brought in $1.47 billion in revenue in the most recent quarter, of which just $46 million came from advertising. The bulk of the company's revenue comes from subscriptions ($1.16 billion). Subscribers are far less likely to cancel their service than advertisers are to pare back spending, which creates less violent peaks and troughs for Sirius XM's business than for its competitors. Secondly, Sirius XM gets to take advantage of the relatively low fixed costs of operating its satellites. No matter how many subscribers the company signs up, it doesn't cost the company any extra to utilize satellites that are already in orbit. Understandably, Sirius XM's content budget to acquire talent and programming can move up and down each year, but its transmission costs are relatively fixed, which bodes very well for its long-term margins and growing subscriber base. Lastly, I wouldn't be too put off by the company's large debt load. The company has generated close to $1.9 billion in operating cash flow over the trailing-12-month period, and it's paying out more than $220 million in annual dividends to shareholders. Sirius XM wouldn't be doing so if it didn't foresee subscriber growth and pricing power in its future. This is a company you can safely sock away in your portfolio for the next 20 years.